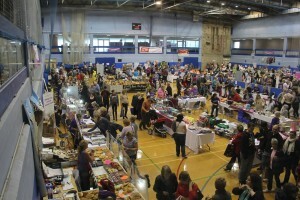 Don’t miss our popular Christmas Gift & Craft Fair, sponsored by Trident Honda, at the Woking Leisure Centre. It’s the ideal place to find everything you will need for the perfect Christmas. We attract visitors from all over Surrey to our Christmas Gift & Craft Fair, offering a one stop Christmas shop. There will be over 100 stalls selling clothing and accessories, handmade gifts, arts & crafts, food & drink and much more! This year the event will be sponsored by Trident Honda and we will see the return of Santa’s Grotto, choirs singing carols, mulled wine and mince pies, the chocolate tombola and fun activities for the kids. For further information please contact our Fundraising Team on 01483 881752 or send an email. Every year we have a huge chocolate tombola at this event, which raises significant funds for the hospices. We wouldn’t be able to do this without the kind donations of chocolate items from the local community. If you are able to donate a chocolate bar, box, tub, bag, multipack, or few, for us to use in the chocolate tombola it would be sincerely appreciated! Chocolate collection points: Receptions at Woking Hospice or Sam Beare Hospice, or any of our Retail shops. A list of our shops can be found here. *Please note that chocolates need to be new and sealed, and in date until 31st December 2016. Deadline for donations is Monday 24th November 2016.